This is a banjo strum stick by Blaine Horlocker. 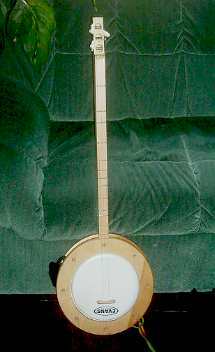 The banjo strum stick is built with the same fretboard as the normal strum stick but with a banjo body. The tone is mellow but loud enough to play alongside guitar and mandolin etc. The tone is a rich old fashioned sound like the old skin type banjos - it has a real old bluegrass sound.